When your permit is granted, you, your spouse and dependent children can also gain residency based on the family reunification procedure. By investing in a Macedonian company, you will receive a residence permit within 3 weeks of submitting your application. This permit allows you to ask for permanent residency after 3 years of being a legal resident, and for Macedonian citizenship after 8 years. 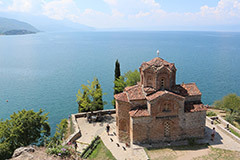 Thanks to a bilateral agreement, those holding a Macedonian passport can travel visa-free to almost 100 countries, including the whole Schengen zone and most countries in Europe. When Macedonia joins the EU, the number of visa-free countries is expected to grow significantly. You have to invest a minimum of USD 500,000 into a Macedonian business in any sector. In addition, you have to employ at least 10 Macedonian citizens. Processing fees are based on the number and age of family members included in your application, so please get in touch with us for a precise quote for your situation.